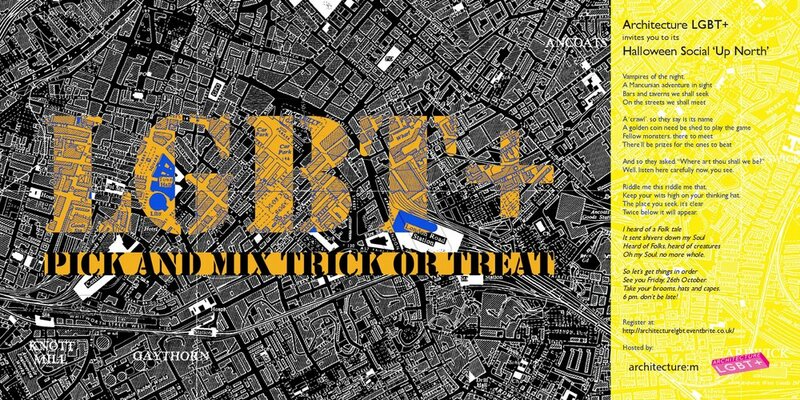 This Halloween Weekend, Architecture LGBT+ in partnership with Architecture:m invites you to a Halloween Social. Mingle and meet fellow students and professionals in the Built Environment sector and their friends in a unique, fun-filled night, ran as an interactive, treasure hunt, photo competition and bar crawl through a few of Manchester's best known bars. There'll be prizes for winning teams. So come up and be vampires of the night! Your first task is to solve where the first event location is. It's found within the event flyer. If you can't view it, It's written below. And don't worry, we shall reveal it later closer to the date. We'd also kindly ask a gold coin donation for the prize pool during the night. So good luck, think fast! Bring your friends! See you there! Well, listen here carefully now, you see. Keep your wits high on your thinking hat. Oh my Soul, no more whole. See you Friday, 26th October. 6 pm, don’t be late!